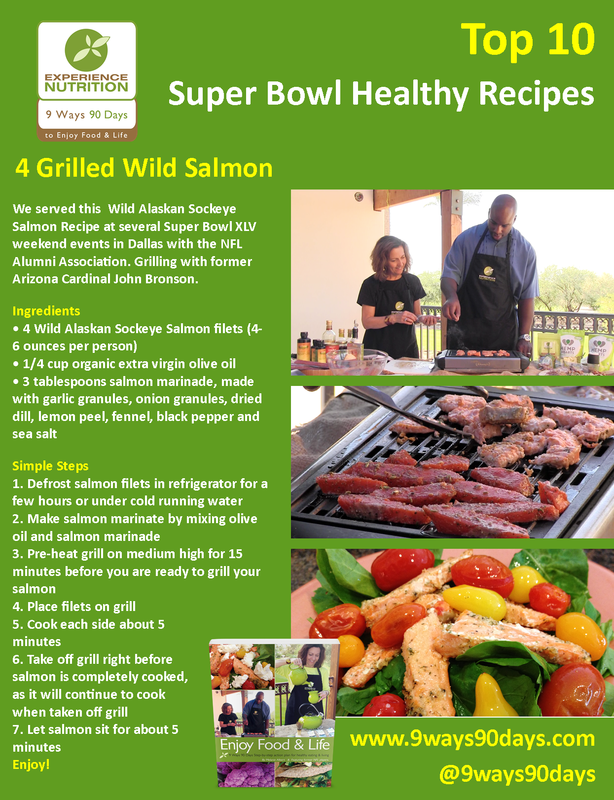 Our 4th healthy Super Bowl Recipe is wild Alaskan Sockeye Salmon on the grill. Full of the good-fat, omega-3 fatty acids, we served this at several Super Bowl XLV weekend events in Dallas with the NFL Alumni Association. This salmon is so delicious, it will melt in your mouth. For the best salmon (after Super Bowl Week), try the salmon from our friends at Vital Choice Seafood. Post photos of your grilled salmon on our Facebook page: www.facebook.com/9Ways90Days. Top 10 photos will win a free e-book, “Enjoy Food & Life,”featuring nutrition tips and recipes by former NFL players and their wives.